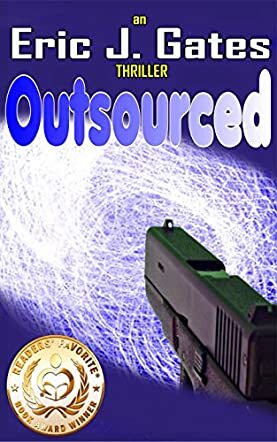 Outsourced by Eric J. Gates is a general fiction thriller novel that all begins with a simple question: What is the most dangerous gift a fan could send to an author if the fan were a professional assassin? Nic Stiles is an author in New York whose life path is forever altered by a single package that arrives for him in the mail. That one package has presented him with the chance to alter life and death and it now sits in his hand. What choices will he make; will he use it or protect it? Outsourced by Eric J. Gates is a book that took me deep down the rabbit hole and into a world of science with quantum mechanics and the supernatural. At first, I was worried that I would not understand the book because of the quantum mechanics involved; however, Gates does a brilliant job at simplifying such a complex science into easy to understand pieces. I walked away from the book with an understanding of what quantum mechanics actually is. Prior to reading this book, the best explanation I could have given was that it was a part of science that involve math. The book itself had a well evolved plot line, no plot holes, and a developed cast of characters. While there were a lot of interesting characters, I would have to say that the main character, Nic Stiles, was by far my favorite. I found him interesting in that he was an everyday person who was suddenly given a gift of unprecedented power!